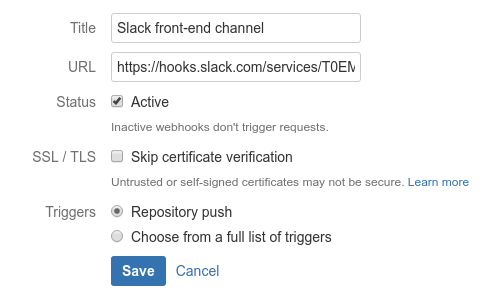 Please add the ability to select a webhook for pipeline build status (specifically for Slack integration) for notifications when a build succeeds, fails, etc. I think you can add curl slack-integration-url in the step to get slack notification. @Robert Mao that is a good point. It shouldn't be hard to handle notification directly from your build scripts. The one downside to this though is you would have to build in handling of reporting the success/failure directly instead of having bitbucket do it for you automatically. Still though, your suggestion would be a workaround for the time being. Just to add, Bitbucket already has a generic web-hook for commit status and since Pipelines uses the commit status API, it should work for Pipelines too. As the description specifically mentions Slack and so does most of the discussion for this request, I'll rename the issue to reflect this. Issue #12944 was marked as a duplicate of this issue. Please see my unofficial snippet on how to set up Slack notifications for Bitbucket Pipelines. Official documentation coming soon. For now, this is limited to the "in progress" and "completed" notifications. Please try it out and give me your feedback. Resolving this request now. For improvements and feedback, please raise new issues. @xtjhin, This doesn't feel resolved to me. I'm going to try out your snippet, however there is no way to currently just get failed notifications with the official bitbucket slack integration. When you get success and failed notifications, that's a lot of extra noise in your channel, when all you really care about is the builds that fail. I agree, this issue doesn't seem resolved. @xtjhin This issue is not resolved since the link you provided is broken. Could you please reopen this request? I too am interested in this solution. Particularly i'd like to lighten my email inbox load and keep our dev team notifications in our chosen slack channel. Looking forward to an update, Cheers!